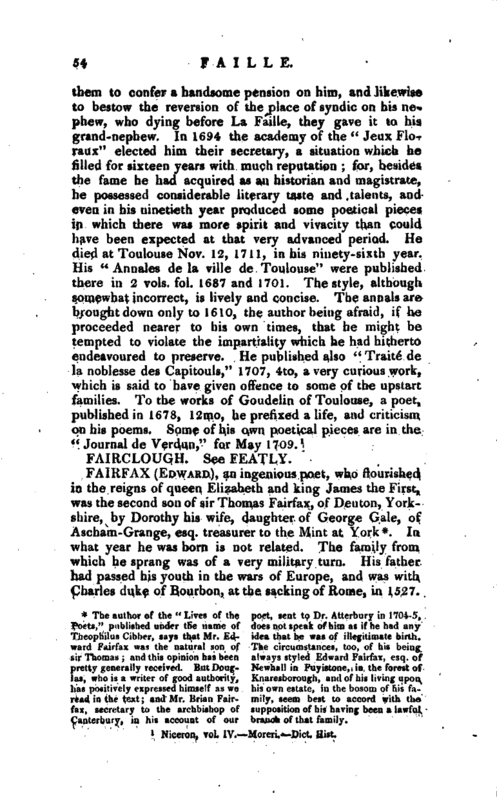 The author of the “Lives of the Poets,” published under the name of Theophilus (Jibber, says that Mr. Edward Fairfax was the natural son of sir Thomas; and this opinion has been pretty generally received. But Douglas, who is a writer of good authority, has positively expressed himself as we read in the text; and Mr. Brian Fairfax, secretary to the archbishop of in his account of our poet, sent to Dr. Atterbury in 1704-5, does not speak of him as if he had any idea that he was of illegitimate birth. The circumstances, too, of his being always styled Edward Fairfax, esq. of Newhall in. Fuyistone, in the forest of Knaresborough, and of his living upon his own estate, in the bosom of his family, seem best to accord with the supposition of his having been a lawful branch of that family. In what year he was born is not related. The family from which he sprang wns of a very military turn. His father had passed his youth in the wars of Europe, and was with Charles duke of Bourbon, at the sacking of Rome, in 1527. | His engaging in this expedition is said to have g’lYen such offence to sir William Fairfax, that he was disinherited; but this is not reconcileable to the fact of his succeeding to the family estate at Denton, which he transmitted to his descendants. It was in 1577, or, according to Douglas, in 1579, when far advanced in years, that he was knighted by queen Elizabeth. The poet’s eldest brother, Thomas, who in process of time became the first lord Fairfax of Cameron, received the honour of knighthood before Rouen in Normandy, in 1591, for his bravery in the army sent to the assistance of Henry the Fourth of France; and he afterwards signalized himself on many occasions in Germany against the house of Austria. A younger brother of Edward Fairfax, sir Charles, was a captain under sir Francis Vere, at the battle of Newport, fought in 1600; and in the famous three years’ siege of Ostend, commanded al) the English in that town for some time before it surrendered. Here he received a wound in his face, from the piece of a skull of a marshal of France, killed near him by a cannon-ball, and was himself killed in 1604. While his brothers were thus honourably employed abroad, Edward Fairfax devoted himself to a studious course of life. That he had the advantages of a very liberal education cannot be doubted, from his intellectual acquirements, and the distinction which he soon obtained in the literary world. Indeed, his attainments were such, that he became qualified to have filled any employment, either in church or state. But an invincible modesty, and the love of retirement, induced him to prefer the shady groves and natural cascades of Denton, and the forest of Knaresborough, to the employments and advantages of a public station. Accordingly, having married, he fixed himself at Fuyistone, as a private gentleman. His time was not, however, inactively or ingloriously spent. This was apparent in his poetical exertions, and in several compositions in prose, the manuscripts of which were left by him in the library of lord Fairfax, at Denton. The -tare and education of his children, for which he was so well qualified, probably engaged some part of his attention. We are informed, likewise, that he was very serviceable, in the same way, to his brother lord Fairfax; besides which, he assisted him in the government of his family and the management of his atVairs. The consequence of this was, that all his lordship’s children were bred scholars, and well | principled in religion and virtue; that his house was famed for its hospitality, and, at the same time, his estate improved. Wiiat Mr. Edward Fairfax’s principles were, appears from the character which he gives of himself, in his book on daemonology: “For myself,” says he, “I am in religion neither a fantastic puritan, nor a superstitious papist: but so settled in conscience, that I have the sure ground of God’s word to warrant all I believe, and the commendable ordinances of our English church to approve all I practise: in which course I live a faithful Christian, and an obedient subject, and so teach my family.” In these principles he persevered to the end of his days, which took place about 1632. He died at his own house, called Newhall, in the parish of Fuyistone, between Demon and Knar* sborough, and was buried in the same parish, where a marble stone, with an inscription, was placed over his grave. 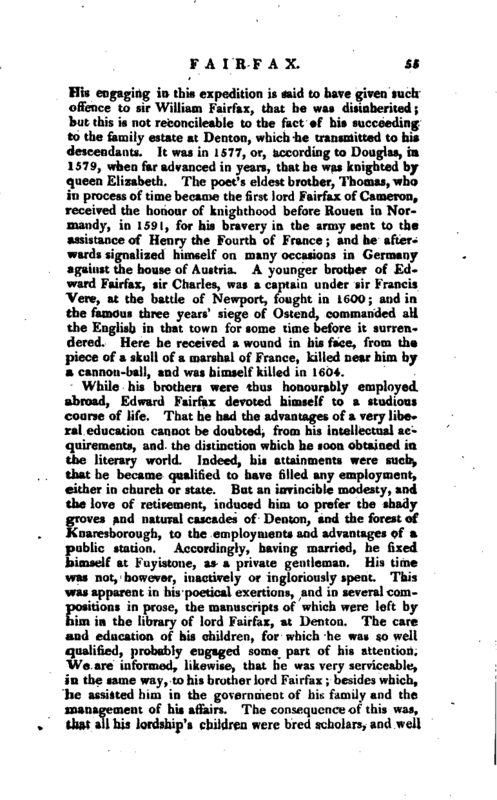 Such are the few particulars that are related concerning the private life of Fairfax. But it is as a poet that he is principally entitled to attention; and in this respect he is held in jqst reputation, and deserves to have his name transmitted with honour to posterity. His principal work was his translation of Tasso’s heroic poem of “Godfrey of Bologne” out of Italian into English verse; and what adds to the merit of the work is, that it was his first essay in poetry, and executed when he was very young. On its appearance, it was dedicated to queen Elizabeth. The book was highly commended by the best judges and wits of the age in which it was written, and their judgment has been sanctioned by the approbation of succeeding critics. King James valued it above all other English poetry; and king Charles used to divert himself with reading it in the time of his confinement. All who mention Fairfax, do him the justice to allow that he was an accomplished genius. Dryden introduces Spenser and Fairfax almost on the level, as the leading authors of their times, and Waller confessed that he owed the music of his numbers to Fairfax’s Godfrey of Bologne. “The truth is,” says the author of Cibber’s Lives, “this gentleman is, perhaps, the only writer down to sir William Davenant, who needs no apology to be made for him on account of the age in which he lived. His diction is so pure, elegant, and full of graces, and the turn of his lines so perfectly melodious, that one cannot read it without rapture; and we can scarcely imagine th,e original | Italian has greatly the advantage in either: nor is it very probable, that while Fairfax can be read, any author will attempt a new translation of Tasso with success.” Without disputing the general truth of this eulogium (which, however, might somewhat have been softened), it cannot fail to be observed, how much the biographer has been mistaken in his concluding conjecture. A new translation of Tasso has not only been attempted, but executed, by Mr. Hoole, with remarkable success and with distinguished excellence; and indeed in such a manner, that in the opinion of Dr. Johnson, Fairfax’s work will perhaps not soon be reprinted. Of Fairfax, it has been justly said that he had the powers of genius and fancy, and broke through that servile custom of translation which prevailed in his time. His liberal elegance rendered his versions more agreeable than the dry ness of Jonson, and the dull fidelity of Sandys and May; and he would have translated Tasso with success, had he not unhappily chosen a species of versification which was ill adapted to the English language. 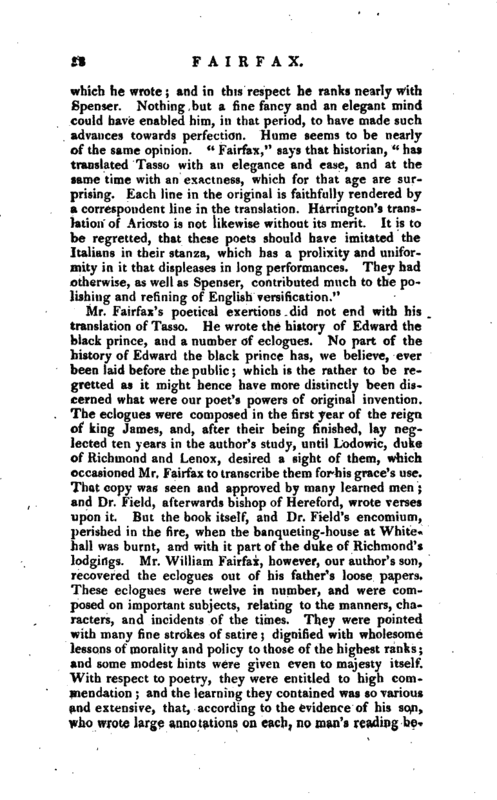 Mr. Hoole, in assigning the reasons for his giving a new version of Tasso’s “Jerusalem Delivered,” remarks that Fairfax’s stanzas cannot be read with pleasure by the generality of those who have a taste for English poetry: of which no other proof is necessary than that it appears scarcely to have been read at all. It is not only unpleasant, but irksome, in such a degree as to surmount curiosity, and more than counterbalance all the beauty of expression and sentiment, which is to be found in that work. 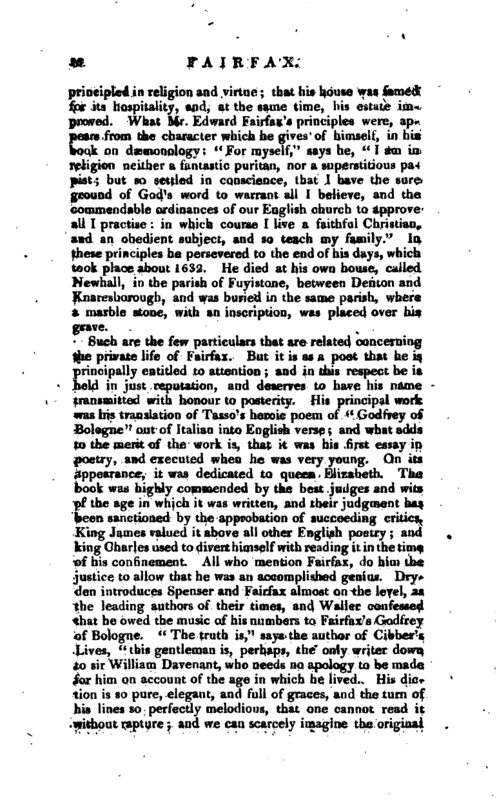 He does not, however, flatter himself that he has excelled Fairfax, except in measure and versification; and, even of these, the principal recommendation is, that they are more modern, and better adapted to the ear of all readers of English poetry, except of the very few vtho have acquired a taste for the phrases and cadencies of those times, when our verse, if not our language, was in its rudiments.“The author of iris life in the Biog. Britannica, however, is of opinion that it was not necessary to the justification of Mr. Hoole’s new version, that he should pass so severe a censure on Fairfax’s measure. To say that” it is not only unpleasant, but irksome, in such a degree as to surmount curiosity, and more than counterbalance all the beauty of expression which is to be found in the work,“appears to be very unjust The perspicuity and harmony of Fairfax’s ver>ification are indeed extraordinary, considering the time in | which he wrote; and in this respect he ranks nearly with Spenser. Nothing but a fine fancy and an elegant mind could have enabled him, in that period, to have made such advances towards perfection. Hume seems to be nearly of the same opinion.” Fairfax,“says that historian,” has translated Tasso with an elegance and ease, and at the same time with an exactness, which for that age are surprising. Each line in the original-is faithfully rendered by a correspondent line in the translation. Harrington’s translation of Ariosto is not likewise without its merit. It is to be regretted, that these poets should have imitated the Italians in their stanza, which has a prolixity and uniformity in it that displeases in long performances. They had otherwise, as well as Spenser, contributed much to the polishing and refining of English versification. 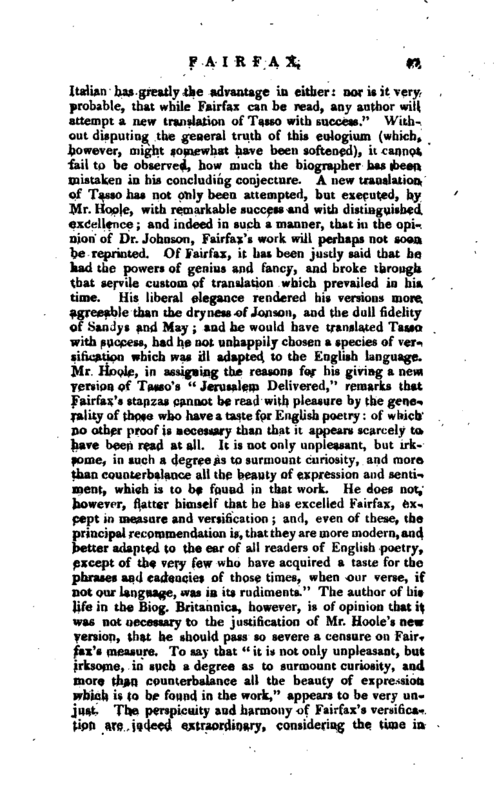 Mr. Fairfax’s poetical exertions did not end with his translation of Tasso. He wrote the history of Edward the black prince, and a number of eclogues. No part of the history of Edward the black prince has, we believe, ever been laid before the public; which is the rather to be regretted as it might hence have more distinctly been discerned what were our poet’s powers of original invention. The eclogues were composed in the first year of the reiga of king James, and, after their being finished, lay neglected ten years in the author’s study, until Lodowic, duke of Richmond and Lenox, desired a sight of them, which occasioned Mr. Fairfax to transcribe them for his grace’s use. That copy was seen and approved by many learned men; and Dr. Field, afterwards bishop of Hereford, wrote verses upon it. But the book itself, and Dr. Field’s encomium, perished in the fire, when the banqueiing-house at Whitehall was burnt, and with it part of the duke of Richmond’s lodgings. 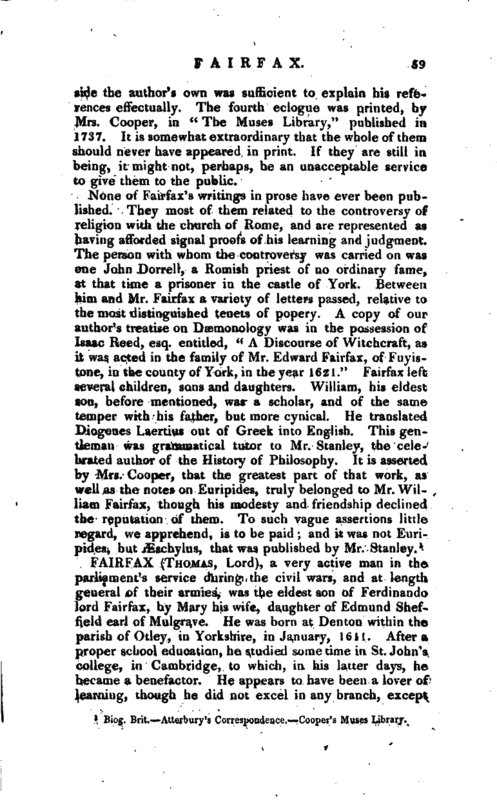 Mr. William Fairfax, however, our author’s son, recovered the eclogues out of his father’s loose papers. These eclogues were twelve in number, and were composed on important subjects, relating to the manners, characters, and incidents of the times. They were pointed with many fine strokes of satire; dignified with wholesome lessons of morality and policy to those of the highest ranks; and some modest hints were given even to majesty itself. With respect to poetry, they were entitled to high commendation; and the learning they contained was so various and extensive, that, according to the evidence of his son, who wrote large annotations on each, no man’s reading be* | side the author’s own was sufficient to explain his references effectually. The fourth eclogue was printed, by Mrs. Cooper, in “The Muses Library,” published in 1737. It is somewhat extraordinary that the whole of them should never have appeared in print. If they are still in being, it might not, perhaps, be an unacceptable service to give them to the public. 1 Biog. Brit, -Atterbury’s Correspondence, -Cooper’s Muses Library.